How do I find the School Base App? Go to your App Store and search for Furlong Software. This will locate the developers of the School Base App. The code 7620 will identify Sancton Wood school. I have forgotten/do not know my user name and password. Please email our Communications Officer, Vorn Hancock. What ‘Domain name’ should I type in? The Domain name that is required for the web browser login is ‘sanctonwood’. How do I book Parents or Options Evenings Appointments? 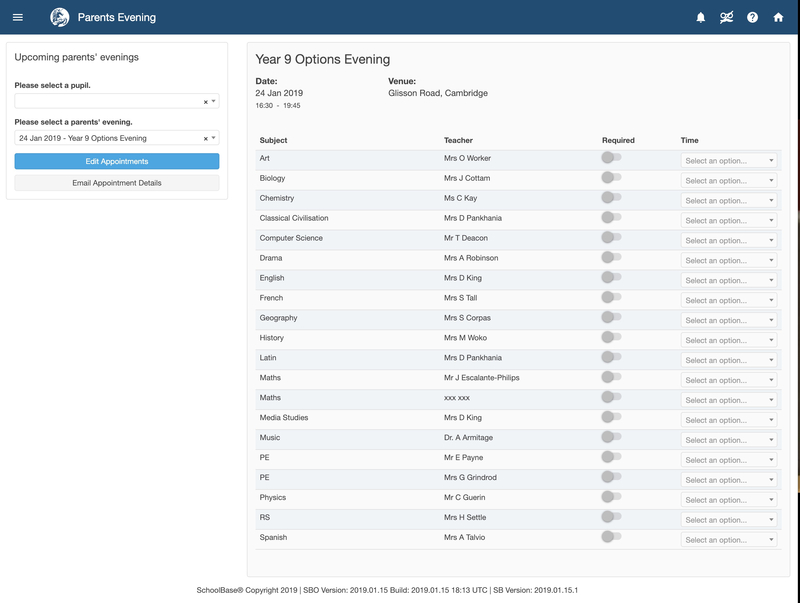 The menu on the left hand side of the main screen (after you log in via a desktop or laptop browser) has an option called Parents Evenings. Clicking on that will take you to a page similar to this one. From here you can choose your child, should more than one attend Sancton Wood. You can then select the evening of interest. Next, click on the Edit Appointments button. Then move the slider across that is next to the subject where you want to make an appointment. Now select the time-slot that you would like to book. Repeat this for each appointment.